And I think it’s awesome how the simple Old Shale pattern makes for this wavy, beautiful look. I’ve always liked this pattern (though I used to call it Feather and Fan pattern, like a lot of people do) and now, I like it more. 🙂 I’d wanted to incorporate Old Shale into a different project before I started working on this one. I still want to use it in the other project, maybe I’ll think of a different way. Back to this project, though. When I think raglan, I always think top-to-bottom construction, but in this bottom-to-top project, it was easier to fix the holes that invariably form at the armhole — the ones at the joins / splits of body and sleeves. The fixer stitches always look weird to me in top-to-bottom sweaters, and they were much better here. Or maybe it’s because it’s black. 😉 I should try a bottom-to-top project with a lighter color to see if this experience repeats. Overall, the general fit, the edgings, and the buttonholes all turned out fine, but as with all my projects, there’s always that something that doesn’t exactly match the expectations of the intended recipient. 🙂 In this case, it’s the neck, which turned out larger than what my sister was hoping for. So it’s My Fair Cardi! My next project is a sweater for my sis. We’d talked about what she’s looking for in it, and she’d said she wanted some eyelets in its bottom half, and a solid top half with some pattern. So naturally, I thought about the Feather and Fan pattern, since my fellow knitting/crochet blogger, Kat, had just talked about her Sage Remedy Top, and I thought the pattern there resembled it. So I looked up the pattern to refresh my memory, and I found that what I’d always thought of as Feather and Fan pattern is actually the Old Shale pattern! Feather and Fan turns out to be a completely different pattern, and Sarah points out the differences in a recent post. Sarah’s post also mentions projects that use Old Shale pattern, and I came upon My Fair Cardi. It’s a pretty simple design, and I’d thought of exactly that for the bottom half, so I showed it to my sis. She thought the cardigan looked good as is, with Old Shale in both halves. Even the shape of the neck was to her liking. Alright then, problem solved! I could just use this pattern. The cardigan is a bottom-up raglan construction, and is knit in pieces — sleeves, front, and back — all the way, and the pieces are joined raglan-style in the very end. 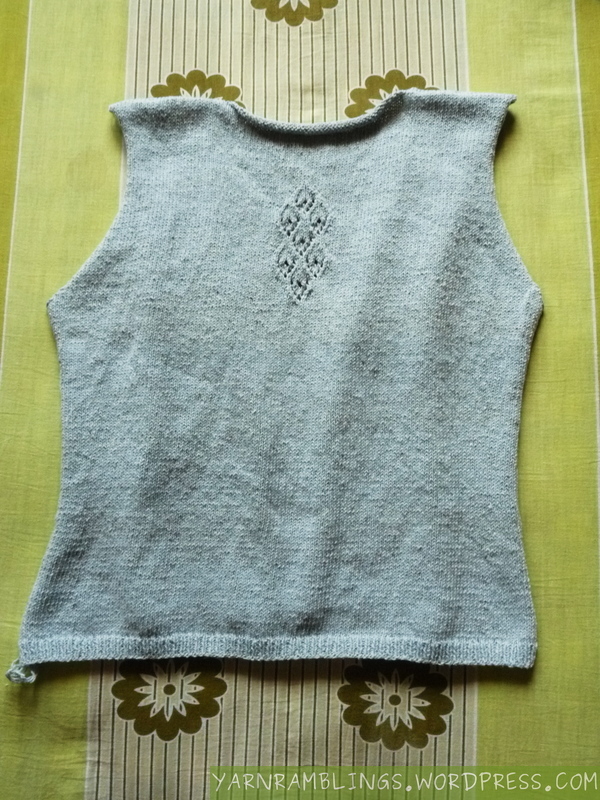 Um, when I’m knitting a bottom-up raglan cardigan, I like to knit the body as one piece, knit the sleeves, and join all the pieces at the armhole and knit them together. So that’s a slight deviation from the pattern for me — other than the usual deviations to account for changes in measurements to conform to my (or in this case, my sister’s) preferences. I’m going to sew up the three front and back pieces at the top by making knit stitches with the sewing yarn. I’ve bound off all of the topmost stitches in all the pieces, but if I didn’t bind off the stitches that will need to be sewn up, it’ll probably make the sewed edge look a bit nicer. I’m not going to undo the bind-off this time, but this is something I’ll remember for my next knit-in-pieces project. To join the pieces at the sides, I’ve decided to use the mattress stitch — I’ve never used it before, and all my sewed edges so far have been very visible. That’s one of the reasons I don’t like knitting bottom to top in pieces. The other reason I’m not too fond of knitting in pieces is the sleeve shaping, which I’ll have to embark on next. It goes great from the cuffs till the armholes. Then comes the tough part of knitting the sleeve to fit the sleeve hole correctly. I did the calculations by myself for just one project, and I was not pleased. That was for a super-lacy project, though, so the holes in the lacy pattern kinda masked the results of incorrect measurements. I can tell you that the calculations seem easy in theory / in my head, but for an amateur knitter trying to create her own pattern, it does get messy at times. Anyway, wish me luck for the sleeve shaping, and as always, I’ll let you know how that (mis? )adventure goes.